Andrew Daddo has been on our TV screens … it seems like pretty much forever. (It’s only about a quarter of a century, but that is quite a chunk of my life, so it seems like a really long time). He started off as a teenager hosting music shows in the 1980s, and became the first Australian to head off to America and work on MTV. As he got older, he settled into fronting up for the kind of programmes where they show the world’s craziest commercials, kids saying the darnedest things, charity events, Cannes Film Festivals and the funny side of the Olympics. He’s also been one of the more informative travel reporters we’ve seen on TV. As Andrew has two brothers called Lachlan (younger) and Cameron (older), who also successfully appeared on television as actors, reporters and presenters, for a while it seemed that the entire Australian TV industry would have collapsed if you removed the Daddos from it. Andrew has an identical twin brother Jamie, who was hit by a car in his teens while he was out celebrating grand final night. He suffered brain injuries, was in a coma for months, and has been in a motorised wheelchair since the accident. He gained his Master of Fine Arts from the Royal Melbourne Institute of Technology, and has worked as an artist for over twenty years, gaining acclaim for his sensitive portraits. He also writes poetry. Andrew’s middle name is Dugald and Jamie’s is Beilby – names which filled them horror for years and made them decide their parents hated them from birth, until they found out they were actually family names with special meanings. Now they have grown accepting of them, and no longer pretend they were never given middle names. Andrew is a successful author of children’s books, and writes for all ages, from preschool to teenager. He is still on television as the host of The One, a reality show contest which pits psychics against each other to see which one is most psychic. He also does the voice-over for The Apprentice. Oddly enough for someone who’s made a successful career out of television, Andrew doesn’t really approve of it, and rarely allows his children to watch TV on school nights. He jokingly refers to himself as “half-Amish”. The Daddos have been in the popular consciousness for so many years that if someone asked to visualise a typical Australian male in his 40s, I would probably picture someone who was a morph of all the Daddo brothers crossed with Hugh Jackman. Despite their sensible Scottish first names, their surname is Cornish, and probably based on the name David, or possibly the word for “good” – yet more hard-working and successful Cornish stock in Australia to add to our list. 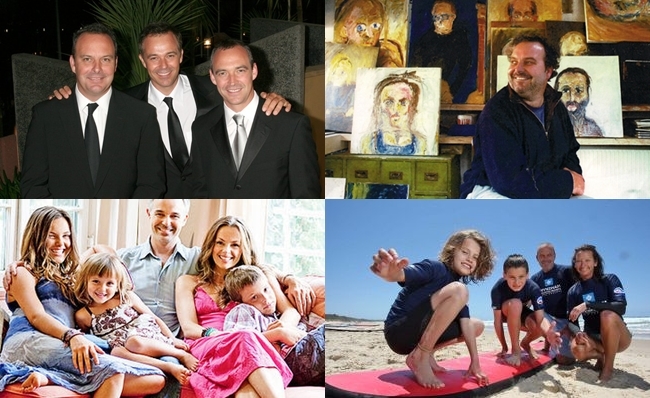 As we look at the children of the Daddo brothers, it’s tempting to wonder if they have produced a fresh crop of Daddos who will, in a few years perhaps, be gracing our television screens. Andrew is married to Jacqui, and they have three children: Felix, aged 12; Anouk Bibi, aged 10; and Jasper; aged 7. I think this sibset is attractive, and the names sound great together. It sounds discreetly fashionable, yet not at all out of place for upmarket Sydney suburbia. Lachlan or “Lochie” is married to Karina Brown, a model and TV host, and they have two daughters: Daisy Isabella, aged 6; and Gracie May, nearly 3. This is a cute, girly sibset that almost rhymes, and with their surname, sounds almost cartoon-like. Cameron is married to model Alison Brahe. They have three children: Lotus, aged 15; River Tru, aged 11; and Bodhi Faith, aged 5 (a girl, a boy, and a girl). Cameron and Alison say they have always liked “unique and non-traditional” names; as they live in L.A., it’s hard not to think of this as a “hippie Hollywood” sibset. As often happens with these cool, unique names, they are already sounding slightly dated (as in, they sound like names that were unusual a few years ago, but now they’re fairly mainstream). Jamie is only recently married, and doesn’t have any children, but of course all these kids are his nieces and nephews. Their other daughters name is Gracie May born back in November 2008. Thank you very much for that information, Jenelle. I have updated the entry accordingly. Oh! Except Baby Lochie Daddo #2 is another little girl. Jasper, Anouk and Felix are fantastic together! All 2 syllables but not matchy sounding, and all of them roughly as unusual as one another (Anouk maybe a bit more than the boys). Very cute. Daisy Isabella is also adorable. When you said the birth hadn’t been announced I was like “Oh, I can find it!” but you’re right, there’s really nothing! And Lotus, River and Bodhi are quite nice together I think. I don’t know if I could go for Bodhi on a girl myself, but I’ve been trying to find a nice girls’ name that could be shortened to Bo because I love Bo but it seems to short and nicknamey to use as a given name. Not that I’m going to be naming anyone in the near future, just for fun.